Apr - 18 | By: POWFest | no comments. POWGirls offers workshops in video production, cinematography, audio recording, set lighting, digital editing and media literacy for girls and non-binary youth ages 15-19. Our instructors are working media producers who inspire participants to be creative, tech-savvy leaders who will help realize gender equity in the film industry. 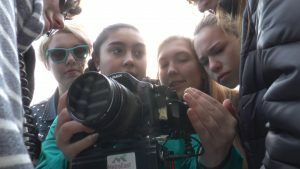 All films produced during POWGirls workshops are screened at the Portland Oregon Women’s Film Festival (POW Film Fest). Over the course of five days, participants will collaboratively develop, film and edit an original short film. Learn collaborative story creation, story boarding, script writing, DSLR camera operation, audio recording, lighting, and post-production video using Adobe Premiere Pro. Check out past POWGirls’ work here! Over the course of seven days, we will help participants to work with a team to develop, film and edit a 1-3 minute promo piece for a non-profit client. See this example that the POWGirls made for The Portland Kitchen and the POWGirls Program. The instruction portion of POWGirls will consist of media production training; pre-production (collaborative concept development, working with a client) camera operation, audio recording, and post-production using industry-standard software. This is a great addition to complement a portfolio of narrative work.